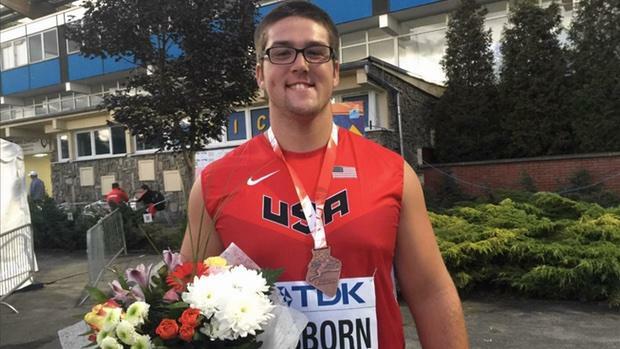 Rising high school senior Bronson Osborn of California earned Team USA's first medal in Poland. Three finals highlighted day one of competition at Zawisza Stadium. In the junior women's 10K racewalk, Zhenxia Ma of China set the year's world junior leading time of 45:18.45. Anali Cisneros was the top American in 25th, with a new American junior record of 49:31.88. Fellow American Meaghan Podlaski placed 28th in a time of 50:21.22. Konrad Bukoweicki of Poland set the world junior record in winning the junior men's shot put with a mark of 23.34m. Bronson Osborn won the first medal of these championships for Team USA, with a third place finish and 21.27m mark that broke the 37-year-old national high school record. Rodgers Kwemoi of Kenya set a new championship record in winning the junior men's 10K with a time of 27:25.23. It was a photo finish as Aron Kifle of Eritrea ran 27:26.20 for runner-up honors and a new national junior record, with Jacob Kipklimo of Uganda placing third in 27:26.68. Americans Thomas Pollard of Iowa State (16th, 29:53.84) and Colin Burke of UCLA (20th, 30:20.80) both set new all-time best marks. Team USA earned its first medal of these championships thanks to a herculean effort by Bronson Osborn in the shot put. The junior men's throwing implements are different from the measurements in typical high school competition --they're throwing 6kg here compared to the slightly lighter 5.44kg prep implement-- so the rising senior at Esperanza High School in Calif. said he had no expectations on hitting particular marks. He also wasn't expecting to medal, but he did so in near-record fashion as his final mark of 21.27m/69-9.5 ranks No. 2 all-time for an American U-20 athlete. John Maurins of Wake Forest set the American junior record at 21.90m/71-10.25 in 2015. The previous national high school record was set in 1979 by Mike Carter of Dallas, Texas at 67-9. Anali Cisneros of Elgin, Ill. broke the American junior record in the 10K racewalk by clocking 49:31.88 and placing 25th overall. She said after the event that she was just hoping to break 50 minutes; she and fellow Team USA race walker Meaghan Podlaski plan to take advantage of being done early by canoeing around Poland this week. Ja'Mari Ward proves yet again that when healthy, he will always steal the show. The recent graduate of Cahokia High School in Ill. advances to the long jump finals as the top qualifier after landing a wind-legal mark of 26-01.5/7.96m (+0.4), a new PB for the oft-injured star that improves on his former best of 25-8.75/7.84m from the USATF Junior Nationals. After sitting out much of the outdoor track season due to injury, Ward is now the No. 9 ranked long jumper in U.S. prep history and enters the final as a gold medal threat. It took a national record to earn a top three medal in the junior men's shot put today in Poland and it took a world junior record to win. All three medalists set new records: Bronson Osborn uncorked 21.27m/69-9.5 for third place and a new American national high school record, Andrei Toader threw 22.30m/73-2 for runner-up honors and a new Romanian junior record, and Konrad Bukowiecki unleashed a massive 23.34m/73-50 --and a roar!-- for the gold, for a new Polish junior record and for a new world junior record. The former world junior record of 23.0m/75-5.5 was set by Jacko Gill of New Zealand in 2013. Buckowiecki also set the world junior record in the standard shot put in June with a 21.14m/69-4.25 heave that took down American Terry Albritton's 21.05m/69-0.75 standard from 1974. "I don't consider this a victory lap. I'm still working. I still got times I want to hit. I got the 200m national record, now I gotta go for the 100m." - Noah Lyles, who has a big day tomorrow in the 100m dash final. The record is 10.00 and the Gator commit is also deciding whether or not to turn pro this week. Read more here. 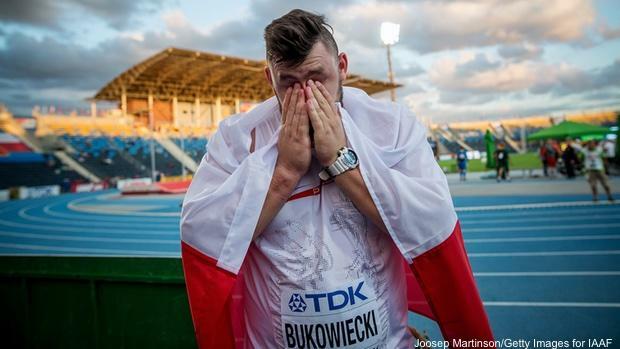 Hometown favorite Konrad Bukowiecki of Poland weeps tears of joy after winning the junior men's shot put title and setting a new world junior record of 23.34m/76-07. Photo by Joosep Martinson/Getty Images for IAAF.